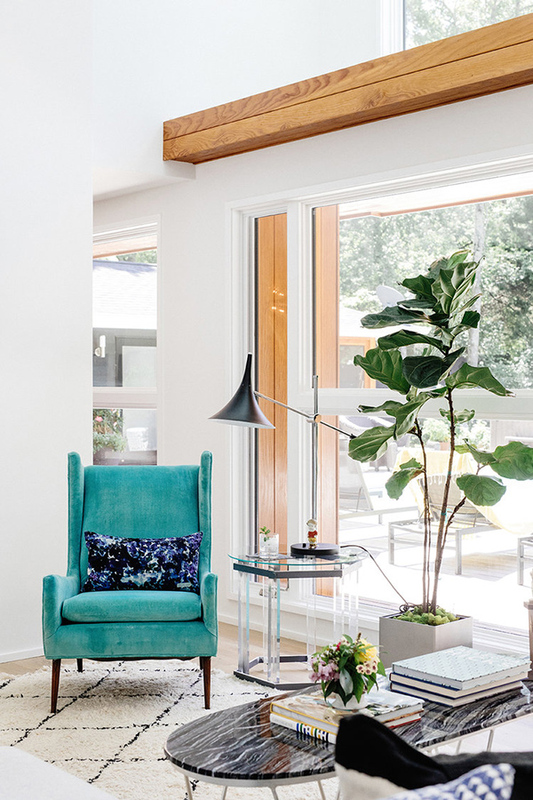 This contemporary home by Crowell & Co.is bathed in white with just the right amount of color accents, some funky abstract art and bold elements. Ready to see that all? Let’s have a look! The main space features a living room and a dining room divided with not a very large wall to create a slight partition. The living room is done with a corner sofa, a couple of chairs and some colorful touches like a turquoise chair or colorful pillows and artworks that enliven the space. Behind the sofa you may see a large artwork, an upholstered bench and a stack of books. Wooden beams here add add coziness to the space. 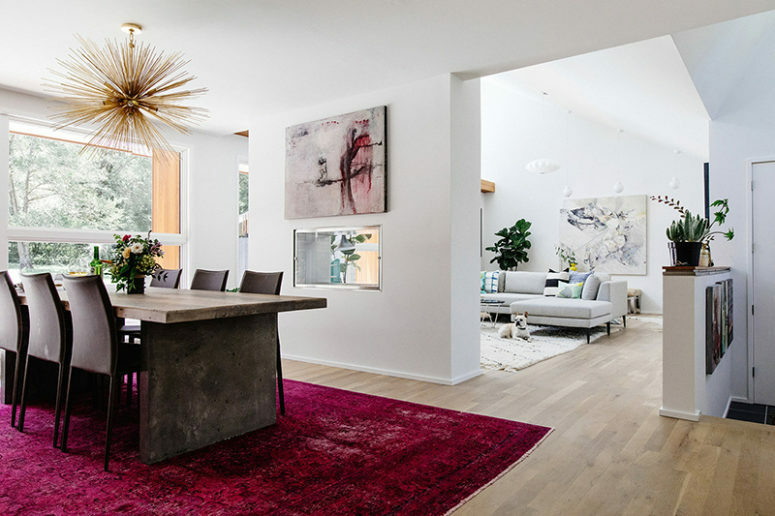 The dining space is done with artworks too but the main eye-catcher is a rough concrete table that is complemented with leather chairs and accentuated with a fuchsia-colored rug. 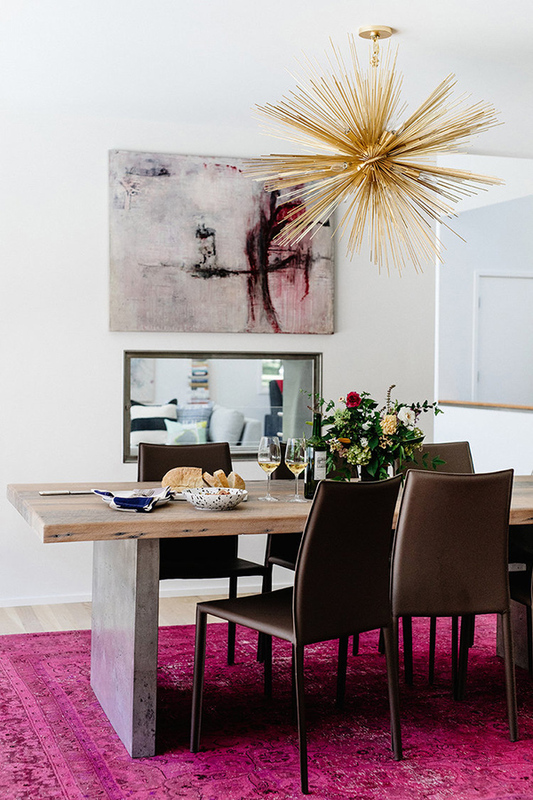 A bold sunburst chandelier makes a statement in the space. 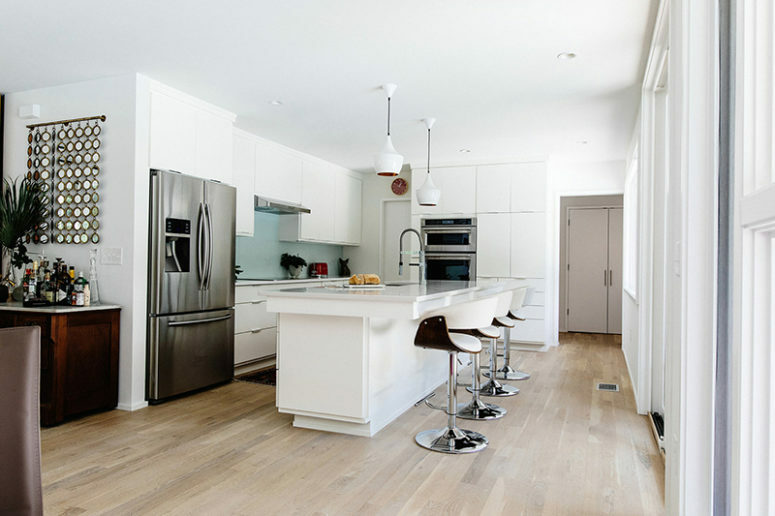 The kitchen is opened to the dining space but is still visually separated. The kitchen is done with white cabinets and a light blue backsplash, there’s a breakfast space on the kitchen island and the space feels very airy. 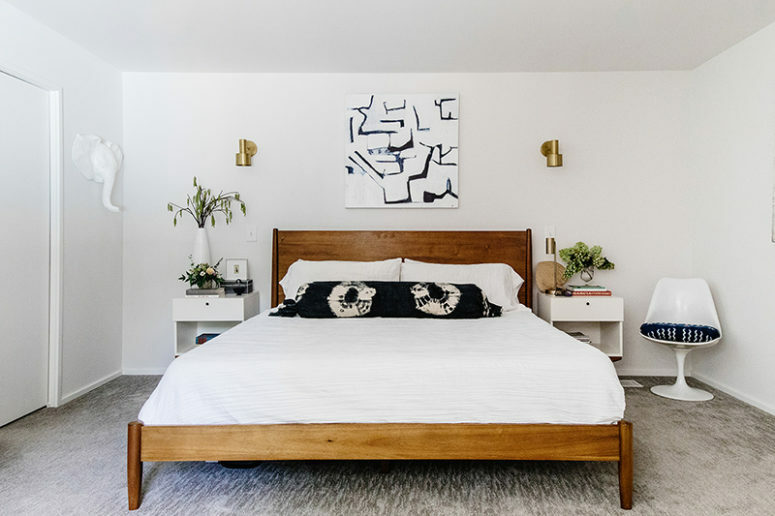 The bedroom features a wooden bed, simple white floating nightstands and a cool chair, cute lamps and a large artwork add to the look of the space. 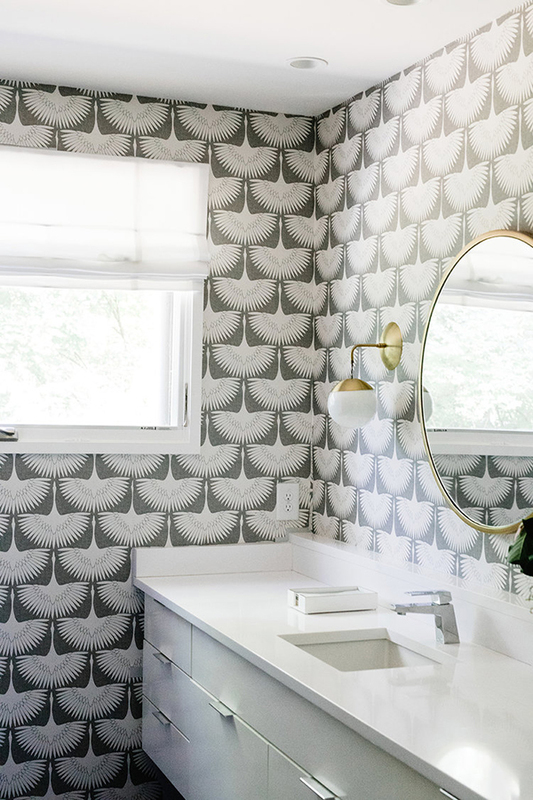 The bathroom is covered with interesting bird-print wallpaper, and gilded touches add chic and a refined touch to the space. 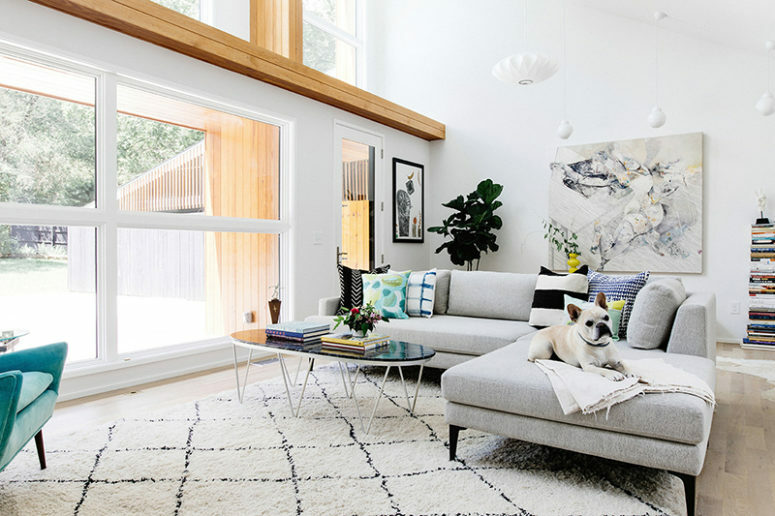 Though the decor seems simple, it’s very comfortable and eye-catching, and chic mid-century modern touches add a refined feel. Now get more of these cool spaces in the pics below!